March is Women’s History Month, a recognition that began in 1987. This week we are focusing on distance riders. As you’ll read, some did it for a cause, some to help build the image of motorcycling, some for the challenge and some…just for fun. If you want to read more about any of these interesting women, an internet search will bring up more details on their motorcycling experiences and beliefs. The mother and daughter team of Effie and Avis Hotchkiss made motorcycling history when they left New York en route to the 1915 World’s Fair in San Francisco riding their Harley-Davidison sidecar rig. But most agree they were not out to set any records. With her mom in the sidecar, Effie, and Avis, were just hell bent to get to the Worlds Fair in California! 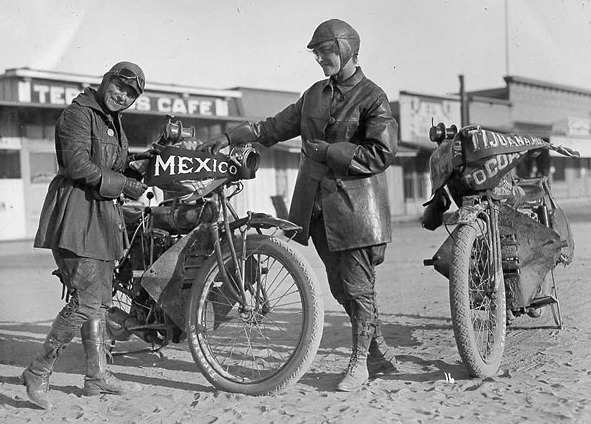 A year later, the Van Buren sisters were still among the first to ride coast to coast, traveling aboard a pair of then new Indian Power Plus motorcycles in 1916. On that trip of about 5500 miles they also rode up Pikes Peak, and were the first women to do so. 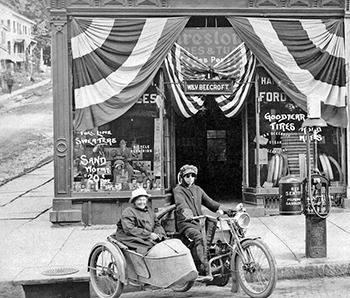 Being descendants of President Martin Van Buren, like Hazel Kolb many years later, they set the example that motorcycling was for everybody, both sexes, all walks of life.2016 marks the 100th anniversary of Augusta and Adeline Van Buren’s courageous and unprecedented ride across the United States on motorcycles. The Sisters’ Centennial Motorcycle Ride http://sistersmotorcycleride.com/ July 3-24, 2016, will honor and celebrate our female motorcycling heroines of the past, as they promote the growth of women motorcyclists and the motorcycling community. An overnight stop near the National Motorcycle Museum is planned. 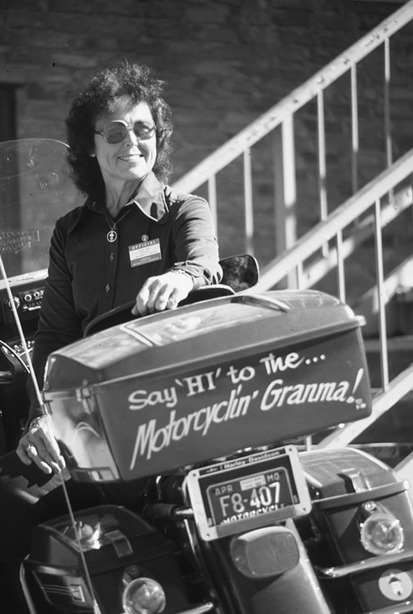 Hazel Kolb called herself “Motorcycling’ Grandma.” Hazel made her “perimeter tour” of the United States in 1979 and worked the media to bring positive attention to motorcycling, and especially women riders. Realizing that those involved in motorcycling were not always viewed in a positive way, Hazel made an effort to be on talk shows, Johnny Carson’s The Tonight Show, and the Good Morning America show, in fact, and arranged interviews with reporters as she visited state capitals. Her nickname, emblazoned on her Harley-Davidson Electra-Glide’s tour pack helped to make the point as well; a woman’s woman who rides! 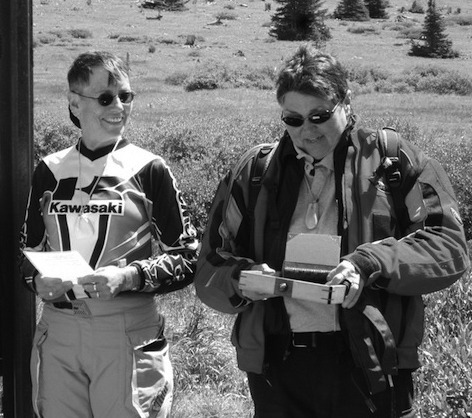 From time to time the AMA bestows the Hazel Kolb Brighter Image Award to honor individuals’ public relations accomplishments in the name of motorcycling. 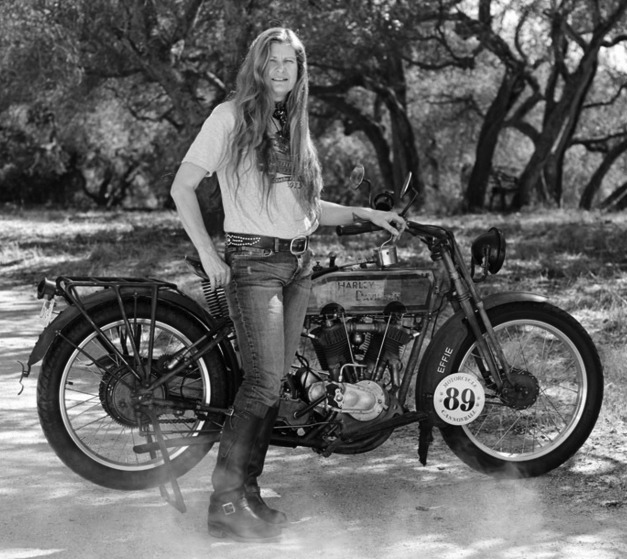 Cris Sommer-Simmons has participated in the Motorcycle Cannonball Cross Country Endurance since its inception, riding machines as early as a 1915 Harley-Davidson, traveling as far 4,000 miles on very antique motorcycles. Cris has authored several motorcycle books. Perhaps her most significant book, The American Motorcycle Girl’s Cannonball Diaries, traces her first coast to coast Cannonball ride in 2010. Sue Slate and Gin Shear are two ambitious women who partnered two decades ago to create awareness for the need to find a cure for breast cancer. Organizing the Pony Express Ride for the Cure in the mid-1990’s, over many years they involved thousands of riders in fundraising to support cancer research. “Gin and Sue are phenomenal women who have truly made a difference in the fight against breast cancer,” says Susan Braun, president and CEO of the Komen Foundation, the beneficiary of Gin and Sue’s work. We’ll bring you more stories of women who have made a remarkable impact on motorcycling next week.